Green pepper like black and white one, are certainly the most popular spices today, which are very enjoyable in cooking and have a long tradition of about a thousand years. Pepper was so valuable in the past that the ancient traders used it as a means of payment instead of money. To obtain it you need to use dry fruits of black, green or white pepper, and their color depends on the time of harvesting. 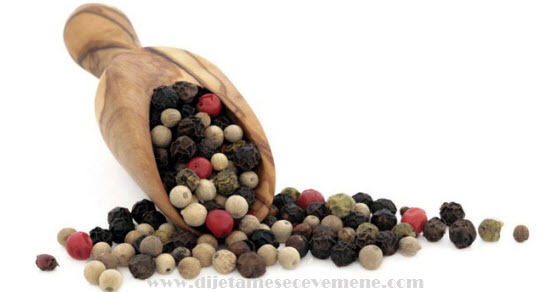 In folk medicine pepper as medicine is recommended because of the beneficial effects in the following conditions and symptoms: fever, sore throat, nausea, dizziness, difficulty in urination, rheumatism and arthritis. Different types of peppers are actually conditioned by the time of harvesting and processing. Although there are about 2,000 varieties of this spice, there are four main types: black, white, red and green pepper. White and black pepper originate from the same plant. Black is commonly harvested when still immature or immediately before ripening, dried in the sun until it becomes black and tough. To get white pepper, ripe berries are taken, which soaked in water, so that the moss can be removed, and then they are dried. Green is obtained by harvesting seeds before ripening. Then it is dipped into salt water, and dried at high temperatures or you freeze it to preserve color. The red pepper is completely ripe, unpolished fruit. In order to preserve the color, it is processed as green. It is best to grind pepper with small hand operated mills, because they fully preserve the flavor. The most aromatic of them is green pepper, while the spiciest is black one, which is also the most represented in the kitchen. The major constituents are essential oils of pepper: phelandren, sesquiterpene and caryopylen – which are present from 1 to 2.5%, alkaloid piperine to 10%, then starch, raisin and low fat oil. Black and green pepper foster the digestive enzymes of the pancreas, which facilitates digestion, improves circulation, acts beneficially to impotence and frigidity, relieves rheumatic and arthritic pains, cramps and muscle cramps. Pepper successfully calms nervousness, insomnia and relieves stress, improves concentration and memory, strengthens the nerves. The oil of black pepper can be used topically against joint pain, will encourage better circulation, but it is equally good for acne treatment, skin tightening and problems with orange peel - cellulite. It is praised by Ayurvedic medicine and in India it is present as a multi-ingredient in medicinal Ayurvedic recipes, in addition to healing curcuma. Green pepper stimulates our body to better absorb vitamin B, beta-carotene and other nutrients maters. It consists of phytochemicals whose antioxidant effects are a good fighter against free radicals, and protects us from the occurrence of cancer. It does not allow long-term water retention in the body by encouraging our body to sweat and regular bladder emptying. The latest research has shown that green pepper can be used to remove weight and help on the road to leanness and thin waist. Excretion of gastric juices and enzymes accelerates digestion of food. However, the most important is the secretion of hydrochloric acid in the stomach, which disintegrates the fat. Green pepper is the strongest of all the others, because it contains a lot of essential oils that successfully dilute deep fat, making it an increasingly common ingredient for removing cellulite - read an article about anti-cellulite diet, if you are dissatisfied with the look of your thighs. When we add to it strong antioxidant and anti-inflammatory properties as well as keeping cholesterol under control, the conclusion is drawn that pepper as a spice is simply unavoidable in the daily menu. Important note: The most important thing is that the pepper is grind manually immediately before each use, in order to reach the desired effect. Pay attention to what and where you are buying it, because the pepper bean may be of different quality, you should always choose heavier, bigger ones with the correct shape. Pour 3 grams of pepper with 1.5 dl of water, add some mint for taste, cover and leave to stand for 10 minutes. Take the beverage and drink it two to three times a day. In a spoonful of honey add a little bit of white pepper and eat it 2-3 times a day for the next four days. Essential oil of black pepper it used for massage, relieves arthritic pain. Rub oil in painful places two to three times a day. Inhaling black pepper can help you quit smoking easier, this has been determined by numerous scientific studies done by some of the leading institutions. NOTE: When it comes to white, red, black and green pepper, however much you love and appreciate it be careful not to overdo it with their consumption. This applies especially to people who suffer from gastritis, stomach ulcers or have problems with Hemorrhoids, it is best for you to completely avoid it and the general recommendation is to avoid it altogether and eat mild and pH neutral alkaline food.